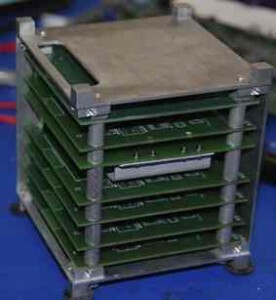 AubieSat-1 (AS-1) is an undergraduate – built CubeSat satellite developed by Auburn University in Alabama USA. AS-1 is designed to transmit with a power of about 800 milliwatts on a frequency of 437.475 MHz, plus or minus Doppler correction [+/- 9 kHz]. The beacon signal, along with telemetry, will be sent using A1A continuous wave Morse code at 20 words per minute. Additional telemetry from the onboard science experiment will use CW transmissions up to 60 WPM. Launched and active. AS-1 is scheduled to launch on 28 October 2011 from Vandenberg Air Force Base in California.